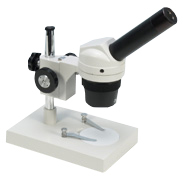 The Portascope is an ideal tool for measuring critical distances on opaque specimens. 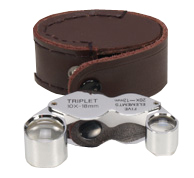 x10 widefield measuring eyepiece and a standard RMS x4 objective, giving an overall x40 magnification. An extremely useful dissecting tool. This is a pair of fine forceps with an attached x4 magnifiying lens which allows fine manipulations. Forceps length 75mm and lens diameter 22mm.